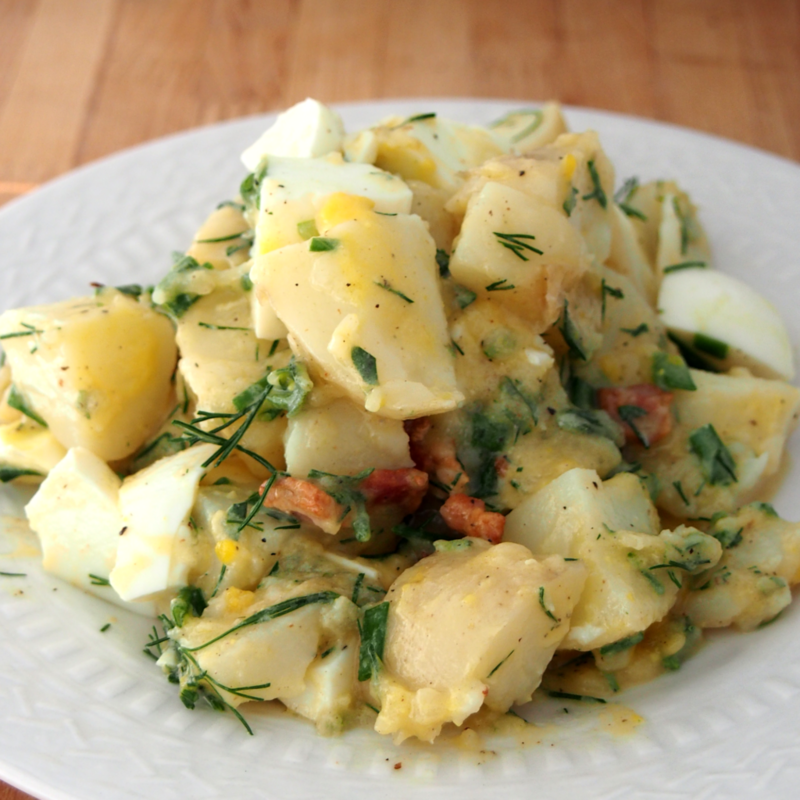 This isn’t strictly a German potato salad, more of a fusion between a traditional American and a German potato salad. No mayo, but there is egg and dill. I really liked this version and definitely would make it again. In the recipes I found online for a German style, there were other ingredients such as stock, caraway seeds, apple cider vinegar, and more. I used what I had and loved the combined flavours. One note – if I had some white balsamic vinegar or white wine vinegar, I would have used some. As it was, plain white vinegar more than sufficed. There was probably a bit more dressing than needed, so if you have a bit more potatoes, I wouldn’t adjust the recipe unless you making a large potato salad. Just remember, you want enough dressing so they saturate the potatoes vs. a drizzle. This is an instance of where lots of dressing is a bonus! Don’t be shy! This is also super addicting next day. Just saying. Slice the bacon strips into about 1/2 inch slices and saute until crisp. Put pieces and the precious fat aside. In a small bowl mix the bacon pieces, bacon fat, grated onion, oil, vinegar, and dijon mustard. Whisk to combine. Pour over the potatoes, add salt and pepper to taste, and combine gently. Set in fridge for at least an hour to chill, so the potatoes soak in the dressing, and give a quick toss before serving.